Join expert free diver and underwater photographer Karim Iliya on a once in a lifetime week-long liveaboard and underwater photography expedition to the Arctic coast of Norway to observe the annual herring spawning run underwater. This natural event draws millions of herring to the Norwegian coastline, and with them come hundreds of hungry orcas and humpback whales. 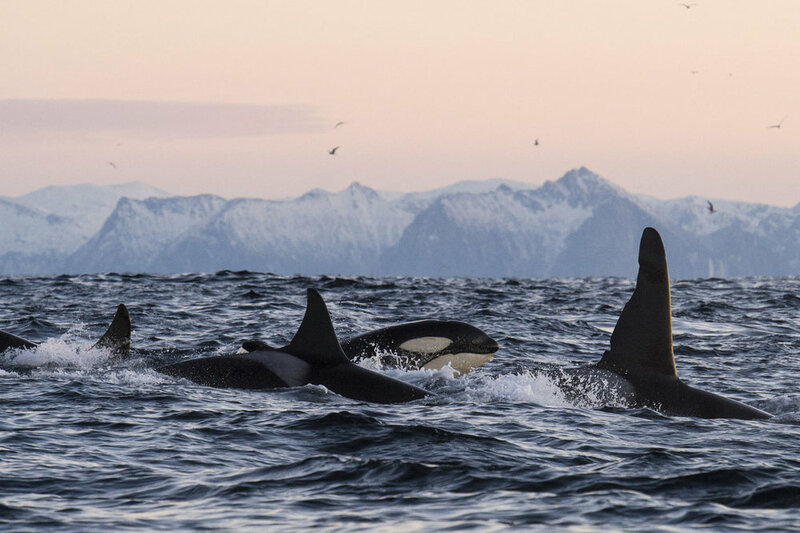 Swim with wild orcas, humpbacks and finn whales off the coast of Norway. Stay on a liveaboard ship and use zodiacs to find the orcas and whales. Learn how to snorkel in a dry suit in Arctic waters. Watch the annual herring spawning run from the most first hand perspective one can get. See the northern lights dance in the skies above as we explore the Norwegian coastline. Check out the beauty of the Lofoten Islands in the winter season. We will arrange a pick up for you from Tromso Airport. Please schedule your flight to arrive before 3pm today, or plan to fly in a day early (should you wish, we can help make arrangements for a hotel for you, additional cost). Upon arrival, we will take you to our boat, the MS Ostsee docked at Esfjordbotn Warff. Our ship contains mostly double cabins and two full washrooms with showers for guests. It's basic, but will serve as our home base and expedition ship as we explore the Lofotens in search of orcas, finn, minke and humpback whales. At 6pm this evening, we will have a buffet dinner on board followed by a safety briefing. You will also get your arctic weather swimming gear (jacket, dry suit, fins) for the week. Our boat will set sail in the early morning hours of the next day while we are still alseep to find the whales. Each morning we will start with a breakfast buffet from 8:00am to 9:00am, before the arctic sun has risen. During breakfast, the captain and or whale guide will inform you about the day's route and plan. As we find whales, we will use a zodiac boat to slowly and carefully approach them to swim with them. Millions of herring are spawning along the shoreline, and this attracts numerous orcas and humpbacks eager to feed. The orcas spin the herring into balls while the humpbacks approach from below with their mouths open. The two groups work in unison with each other to feed. We return to the mothership for lunch at 2:00pm each day and shortly after lunch the sun will set, as this is winter in the Arctic Circle. We will quietly sail around the islands looking for the northern lights until dinner, which is served at 7:00pm, followed by lectures, presentations, lessons and drinks. Quiet time begins from 11pm. Our boat is scheduled to return to the warff in Tromso at 9am today. We will arrange airport drop offs throughout the day, 2 hours before your scheduled departure. For those interested in spending the night in Tromso, we can help arrange a hotel for you in the city (additional fee). Accommodation on the liveaobard ship (6 nights, double occupancy). Airport transfers and local transportation. Three meals per day while on the ship (including dinner the first day and breakfast the last day. Professional whale guide, capitan and expert team. Dry suits, diving jackets and fins. Camera equipment and underwater housings (optional). Optional land excusrions and additional land accommodation if desired. Airfare to and from Tromso, Norway. To sign up to join this trip, please fill out the application form by clicking on the button below. A deposit is due to us immediately after a successful application, so we ask that you only apply when ready to commit to the trip. Enter your complete name as it is written in your passport. If you're not ready to sign up yet but would like to receive updates on this trip and other related Inertia trips, you can enter your email address below to join our interest list. I agree to receive very periodic emails about this trip and other related trips from Inertia Network. Get updates, discounts and exclusive access to new adventures.